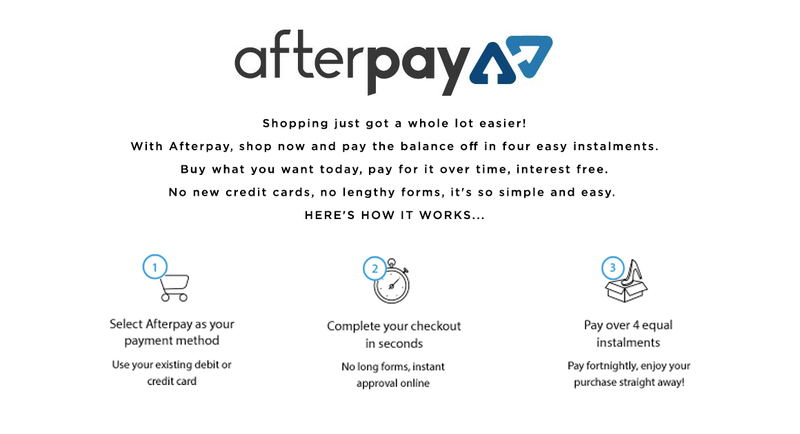 Curvaceous plus size clothing is happy to now offer Afterpay for online purchases and at the showroom for purchases OVER $50 - Buy now and pay later which makes buying online easier to budget! Afterpay will automatically take payment from your Visa or MasterCard on the due date. They currently accept MasterCard and Visa credit and debit cards issued in Australia from any bank. The scheduled payment dates can be seen in the confirmation email sent to your valid email address after you order was approved, or by logging in to your Afterpay account at afterpay.com.au. To avoid late fees, simply ensure sufficient funds are available on your credit or debit card to ensure the payment is made successfully. Once your order is placed we are under no obligation to make changes or cancel an order, however if we can we will do this for you. A cancelled order will incur a 10% restock charge. Afterpay is a free product and charges no interest, however you will have a late fee applied if you do not meet your payment schedule. Please ensure you read the Afterpay terms sent to you. Any purchases made with Afterpay must be received by us within 14 days of your receipted delivery date, full priced items may be returned for a refund or store credit as per our refund policy. Sale or clearance lines can be returned for a store credit only, your repayments to Afterpay remain the same and your credit is available to use with Curvaceous. Please note that you can not return orders paid with Afterpay in store for a store credit, these may only be returned in store for an exchange. Returns received 15-30 day will be given a store credit only. Returns after this time will be rejected. Afterpay is a financial product and it is important you read the full term and conditions of their product offering here before deciding to sign up for an Afterpay account at checkout. Buying plus size clothing online in Australia could not be easier with Afterpay. Buy your favourite plus size tops, dresses, pants, skirts and more at Curvaceous.